Crown Heights, NY - When he was 18 and still living in his hometown of Chattanooga, Tenn., Beryl Epstein received a call from his older brother, Mordechai, who was about to join the Israel Defense Forces. Mordechai urged his younger brother to come to Crown Heights, a largely ultra-Orthodox Jewish neighborhood in Brooklyn, N.Y., where he was studying before heading to Israel. “I knew there must be more—something I was missing,” recalls Epstein, 53, who grew up in a secular Jewish home. His visit to Crown Heights the following year, 1977, inspired him to move there and to join the Chabad Lubavitch, a Hasidic Jewish sect predominant in the neighborhood. Inside his new community, Epstein noticed there was a misconception among outsiders that Lubavitcher Jews—who are distinguished by dark clothing, frequent use of Yiddish and what they say is an unyielding focus on devotion to God—shun the outside world. One man pulls out his iPhone. Chabad, which is headquartered in Crown Heights and is well known for running Jewish study centers around the world, has eagerly harnessed technology to spread its message. The synagogue’s activities are streamed live on the Internet at www.770live.com. In adjoining classrooms, lessons are digitized for students to download. no,no,no.he comes from a regular ch family but made himdelf into a rebbe in bp. 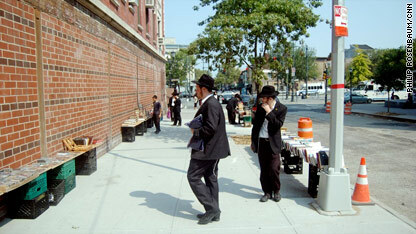 There's a misconception by many, including this article which states that the main shul's address is 770 eastern pkwy. That's not so. It's the building adjacent to the main shul that has its address as 770. That was where the previous rebbe lived and where the rebbe mh"m z"l had his office. We refer to the entire complex as 770. There is a contiguous entrance which no one except the Rebbe used from what I remember (I don't live in NY). smicha is not the question.neither is chesed.if i one day decidei i'd like to be called the los angelaser rebbe,what do you call that? This is great bring goyish tourists into a Shul and Mikvah. What's next "Jews for Rebbi" knocking on doors to convert people? ?